Toby Rankin in Editor's Picks UK Politics on 20 March, 2019. As Theresa May falls to yet another defeat in the House of Commons, for she is now the proud owner of two of the largest Commons defeats ever handed to a Government, the prospect of a second referendum seems to be becoming a more realistic prospect. There is fierce debate as to whether such a referendum should proceed. Some suggest the slippery slope argument: if you allow a repeat vote on a referendum, what’s to stop there being continuous repeats until the ‘desired’ result is obtained? Some say that a second referendum must happen because the first one was flawed, voters voting based on flawed arguments amidst electoral fraud. 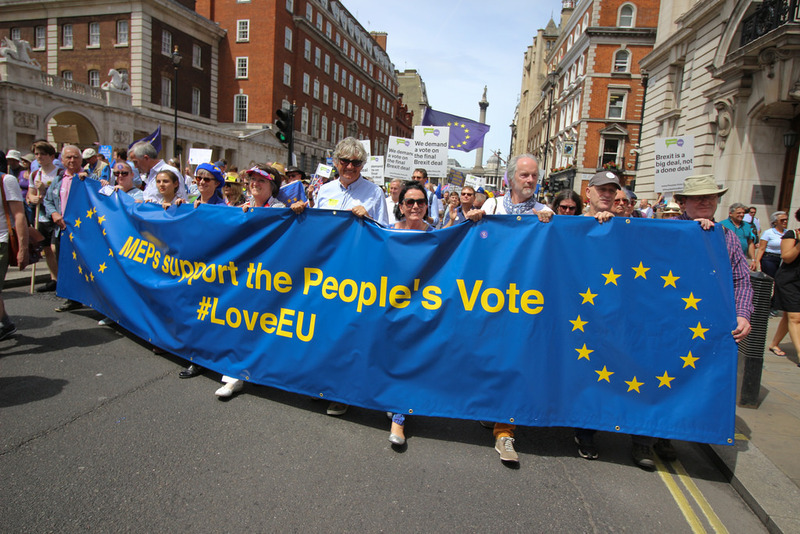 Others argue that the ground has shifted so radically since the first referendum that Brexit now means something fundamentally different to what it meant in 2016. Among numerous other reasons. There is one question that seems pertinent to me. Why would we resort to a measure that brought us to such a catastrophic cliff-edge in the first place? Referenda are not the panacea that people claim them to be, dressed in the seductive language of ‘democracy’. The reason our representative democracy exits is in part due to the acceptance that the lay-man simply doesn’t have the ability to comprehend the breadth of issues dealt with by society at large. Health care, environmental law, financial regulation – these are amongst some of the most complex briefs dealt with by our political system and are largely devolved to a series of bodies run by experts which are overseen by parliamentary select committees. And yet when it comes to the EU, a body that encompasses all of the complex minutiae of the aforementioned issues and much more, it is assumed that the everyday man and woman can come to a decision based on a clear and nuanced understanding of the issues. It is also assumed that voters vote in isolation, that their vote isn’t influenced by extraneous factors such as their general level of ‘pissedoffness’ towards what is considered the status-quo. This is not to suggest that accepting the status-quo is good or correct, I am highlighting the emotional content of a person’s vote. And on an issue such as the EU, emotion is a poor man’s crutch. For a referendum to work it requires the following: A question that is precise and clearly defined yet simple, pre-vote debates, strict regulation of electoral law, an understanding of whether the vote is advisory, and stipulations as to the vote share needed to pass the referendum. What did we have? We had a fuzzy question that gave no explanation as to what leave or remain were meant to be. If, for example, I say I’m leaving the house, it would be perhaps be pertinent to say where I’m going. And perhaps the default assumption shouldn’t be I’m also leaving the country. The problem was that the scope of the question was far too broad and left people with wildly differing expectations. We also had a campaign based on falsehoods and emotional manipulation, since the Leave campaign blatantly flouted electoral law. The Cameron Government also allowed a majority to dictate a constitutional change and neglected to include a condition requiring that at least 40% of voters support leaving, much like the Scottish referendum did. I would have greater sympathy for a second referendum if we had a competent Government in power, one not riddled by Cabinet resignations, and not held hostage by the extreme elements of its party. Can you imagine this Government introducing a referendum held under the condition that a supermajority vote in favour of Brexit so that Brexit happen? Of course not – the ERG simply wouldn’t allow it. What is to be done? It has become clear over the past two years that Brexit doesn’t really exist. Brexit means one thing to each man and his dog. ‘Hard Brexit’, ‘Soft Brexit’, Norway, Norway Plus: all spouted without any clarity as to what they mean. Paradoxically, the past two years have brought more clarity to what Brexit means than the campaigns two years ago. We have now spent two years examining what Brexit means for us. The advisory referendum has been duly followed. We have examined the issue. We have tried to find a solution that appeases everyone. It doesn’t exist. And with that, Brexit should be put to bed. Pass an extension to Article 50 and then pass the required primary legislation to cancel Brexit. That’s not to say that we shouldn’t address why so many people voted to leave. Brexit was our Trump, a symptom of an economy that is quite simply failing. The loss of manufacturing jobs to China, the rapidly growing income inequality, the falling quality of life. The incoming threat of automation may be devastating. Deep flaws in our Parliamentary system have also been highlighted. The House of Commons has ceded too much power to the Government and our system of voting has led to the creation of parties vulnerable to their extreme factions. What do we say to Brexit? We say thank you. Thank you for revealing our weaknesses. Leaving the EU has been the stress-test our democracy needed. And we have been found wanting. Ranked choice voting, an end to austerity, fundamental changes to our economic system, robust regulation of ‘fake news’ and social media at large – these are things that might bring about the structural change necessary to improve the quality of life for those people who feel, and rightly so, marginalised. Our society has neglected the white working class – white working class boys are the demographic least likely to finish school – and those in deprived regional areas. Can we realise that the problem is us and not the EU? Maybe.